With so many people in your life at such dramatically different places, it’s easy to focus on what you have left to do, what you have yet to accomplish, all the things you want to do in your life...but you’re just not there yet. It can be overwhelming. So instead, I’m going to take a moment to focus on several of the ways I’ve already been living through interesting times. Oldest child Being the eldest of three siblings has certainly made my life interesting. I couldn't even list all of the ridiculous awesome things I've done with my little* sister and brother. 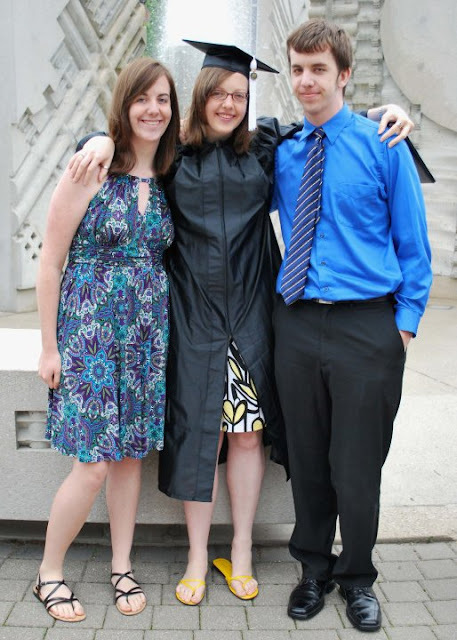 Here's the three of us at my college graduation. *They'll both get mad at me for calling them "little"** because they've been taller than me for years. **Hi, guys! You know I do it because you get grumpy about it! Picture by one of my parents. We need to be standing next to a normal-sized person, so you can get an accurate idea of the height going on here. Building a house in Miami over Spring Break In 2008, a friend and I signed up to spend our Spring Break in Miami, Florida, building a Habitat for Humanity House. I later described the experience in the future tense as "Instructions for 2008." Drive to Miami for Spring Break. 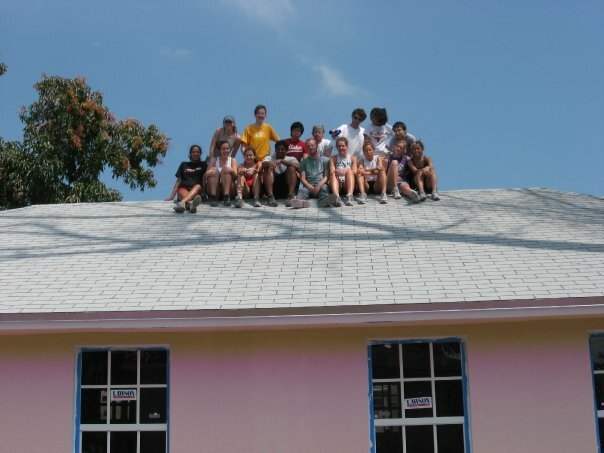 Spend hours on the roof of a Habitat for Humanity house, learning to shingle. Perch on the roof of the Habitat house, looking at the sketchy house on the corner where fancy cars are always coming and going. Go work inside the house, nailing square “Jesus nails” through studs into the concrete. Remember how it feels to see work pay off. Picture by someone with my camera. On the roof with the team. The roof we shingled. Like a boss. I'm the goof in the back with the blinding yellow shirt. Watching the Inauguration of Barack Obama from the National Mall My dad and sister and I drove from Indiana to Washington, D.C. in January 2006 to stand on the National Mall and witness the inauguration of Barack Obama. It was amazing and wonderful and freezing and horrible. I would probably never do it again, but I am very glad to have done it. Picture by Callie Leuck. This was such an awesome day. Everybody was extremely happy. If I were to pick a day to embody the word "jubilant,"I would pick this day. It was also cold as heck and I am happy I didn't lose any toes. Learning how to swing dance Not only is swing dancing fantastically fun, it was the cornerstone of what eventually became my college social group. Those who I didn't meet through swing dancing got brought into the fold sooner or later. It was not always wonderful -- as with any social activity, there were bumps and hurt feelings and cliques and gossip and disgrace. But it was worth the occasional awkwardness. And the elusive great dance that everyone is always seeking...when you get it, it's nearly transcendent. 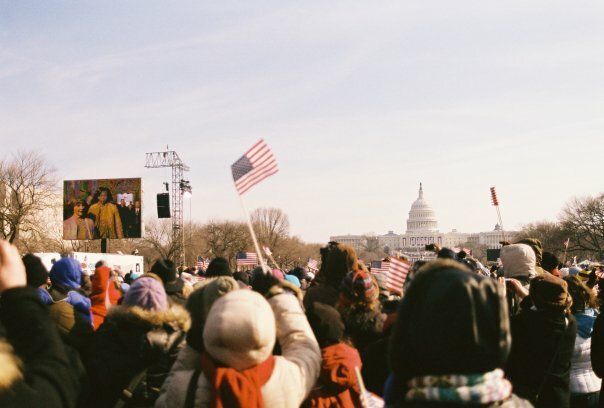 Picture by Cara Leuck. One of the only pictures of me swing dancing where I don't look like I'm (1) stoned, (2) angry, or (3) nauseous. I guess I make a lot of weird faces when I'm focusing. Also it's one of the few showing my face rather than the lead's. A lot of people tended to like to capture my lead's face. For good pictures of swing dancing, check out Liz's post on the topic. Stay tuned for Friday, when I plan to be talking about one more major example of interesting times in my life.